Development drilling differs from exploration and appraisal drilling in that data acquisition is no longer the main aim of the game. By this stage the field has (hopefully) been reasonably well understood and the locations of what will be the producing wells have all been selected. The goal in the development drilling phase is thus simply to drill targets as efficiently as possible. Whilst it is always potentially useful to have more data, during development drilling data acquisition programs are usually far less intense than during exploration drilling. A mud log and a single run of wireline tools may well be enough to confirm the reservoir has been intersected where expected. Development wells can be complex, with long horizontal sections to tap thin beds, and even multiple branches spurred off from a single surface well to target several areas of a reservoir from one set of surface production equipment. Fracturing and acidising of the reservoir may be used to help maximise well productivity and if need be, multiple injection wells may be included in the development drilling program to again aid field productivity. Once the development wells have been drilled, the drilling rig will leave the field and infrastructure will be put in place to allow the control of the producing wells, safe storage (if required) and export of oil and gas. As with drilling, the nature of these facilities is more complicated (and thus capital intensive) offshore than onshore. The same comment is true of gas versus oil; the infrastructure to handle gas production has to handle higher pressures of a much more mobile ‘fluid’ and as such usually demands higher specifications than the infrastructure that would handle the energy equivalent amount of oil production. 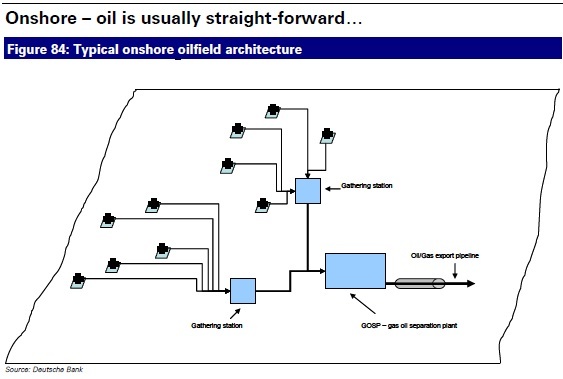 For oil the standard onshore field architecture is straightforward; oil is gathered by a network of pipes into a central treatment plant, where any associated gas and water is removed (a ‘GOSP’ – gas oil separation plant). The crude is then either piped or trucked to a refinery, or export terminal. The GOSP in a modern development will do something useful and environmentally sound with the ‘waste’ gas – either send it back to the field for re-injection or supply a local gas market of gas export LNG plant. For most of the life of the oil industry, associated gas has been considered nothing more than an inconvenience encountered during oil production. The safest action to take was simply to burn it – i.e. ‘flare’ it. Today this is unacceptable in most countries not only from an energy wastage standpoint, but also because flaring gas is a material contributor to greenhouse gases. In the case of onshore gas wells (i.e. pure gas fields rather than ‘associated gas’ produced with oil), there are usually fewer producing wells required in the first place than for an oil field (since gas is far more mobile – i.e. it flows through even relatively low permeability rock much better than oil), but the wells still need to be tied back via pipe to a central processing station, where any water, sulphur or other impurities are removed. If the gas is destined for local market distribution then it is usually treated to have an appropriate calorific value. Where local demand does not justify the development of a large gas field then LNG is usually the only option (although GTL economics will likely improve with time and technological learning). A large diameter pipe transmits the gas to the LNG plant where it is treated before being cooled to –162°C for export as a liquid. The world’s offshore oil and gas developments are dominated by permanent structures (i.e. ‘platforms’). In shallow waters (400ft or less) these usually stand directly on the seabed and are constructed from steel or concrete. Offshore wells are extended via rigid pipe all the way to the platform, where control valves (the ‘christmas tree’) allow manual or remote opening/closing of each well independently. This setup also allows access to the wells at a later date for work-over or other remedial operations. In water depths greater than a few hundred feet, rigid platforms installed on the seabed start to become too expensive, just from the sheer volume of steel and cement that is required. A variety of solutions are used by the industry to develop such ‘deep water’ fields, including FPSOs (floating production, storage and offtake vessels), SPARs, TLP (tension leg platforms) and Compliant Towers.